Bill Boushka: Reprise: could I really have become a math teacher as a second career, after all? Reprise: could I really have become a math teacher as a second career, after all? I still look back in retrospect, did I “blow” the chance to become a high school math teacher as a “second career” for a few years, after age 60? In 2003, while still in Minneapolis, I looked at the possibility of substitute teaching there, and saw that only licensed teachers were hired even as subs or, as they called them, reserve teachers. Certification seemed to require a full year as a full time student, although there were several programs at Twin Cities universities (including the U of M). I came back to Virginia for family reasons in August, but I did not think about checking out the situation in Virginia in advance. In March of 2004 I accidentally heard about the “Career Switcher” program from a television ad, and quickly checked and found out that Virginia school districts could hire unlicensed subs (even with only two years of college). It was even possible for unlicensed subs to work as long-term subs, and sometimes even teach summer math courses. I also found out that there were some low cost and fast-track courses to get the 180 clock hours required for certification. What would follow has been documented here on the blogs before. But my biggest problem was discipline with certain kinds of students, who need a sense of attachment or imprint, a belief in the teacher as an “authority figure” for its own sake. Another problem is that I did balk when accidentally (and by surprise) drawn into situations (with certain special education students) that were more intimate than I thought appropriate. And still another issue was my web content, the biggest incident of which I documented here on a posting July 27, 2007. Suppose I had “found out” about the “demand” in Virginia before moving back. I could have become a sub immediately in September 2003, and probably had better assignments than I did (because of starting at the beginning of the year). Perhaps I could have taken a “fast track” course with a local northern Virginia campus of Old Dominion University in the spring of 2004 and had a full time job in the fall of 2004. Perhaps I could have focused only on my strengths – academics – reviewed all my graduate school mathematics and wound up teaching AP calculus. (I did take the Praxis in September 2005 and mgot a good score in Math.) 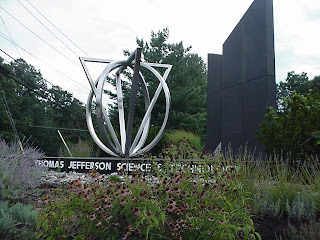 I might have wound up with Algebra 1, but just Maybe I could even have wound up at the esteemed Thomas Jefferson High School of Science and Technology. I could have led a different life. Let me add something here parenthetically: I would not have taken the "opportunity" to "burn 'em again" (or "hang 'em high"), making up for karma at the University of Kansas back in 1966-1968 when I was a graduate student assistant instructor (and I did give some F's -- at a time of the draft). Well, maybe I would have come up with some challenging exam free response problems for calculus. But tests have become pretty standardized since the time I went to high school (since they aim at passing SOL's), and are often largely mutliple choice (with certain patterns of variation for different classes and rows); test making is no longer a prerogative of teacher "creativity". One concern is that the greatest demand really appeared to be for special education and for younger grades, the other direction than my strengths. This brings up some “personal problems”, which I would call “political problems” as much as personal (even if some administrators who remember me disagree). Federal law (the 1993 “don’t ask don’t tell” law for the military) says that I am legally as less worthy, second class citizen, not only because of the marriage issue (that’s DOMA), but because I cannot legally share the risk and burden of defending the country without distracting or disturbing the cohesion of others. If that is so, how can I be perceived as a legitimate, competitive male role model? There even could be legal questions of consent if some of those intimate situations had actually come about, as well as a practical risk of false accusations. I must admit that, as an "introvert", I do not like people to cling to me, and depend on me to "cue" them with emotional "acting out," or with a "relationship" that is not "real." The other big question is about the Web. As a short-term substitute (using the on-call assignment systems like SIMS) I did not have the responsibility for assigning grades or making important discretionary decisions about students. Were I to become a long term sub or a permanent teacher, io would. According to my understanding of ethics and my perception of “conflict of interest” at the time, I would have needed to pull all my political writings off the web and no longer have them available. All of this would have been evolving for me just as social networking sites were coming into prominence and wide use. We know now that I would have been left vulnerable to what others post about me on the Web, and given my background, I think I would have been exposed, unless in a sheltered (“spoiled”) environment where I taught only more advanced students. In fact, it seems that we’re entering a world where people cannot simply remain mum and keep a low public profile if they are in sensitive positions to pass judgment on others (what I used to see as a controlling principle); they have to develop their own online public reputation for someone else’s (their employer’s) agenda. Imagine what it must be like now for, say, a life insurance agent. Given my background of 12 years in I.T. in life insurance, it’s not surprising that I was also approached in 2005 about becoming an insurance agent. I just could not see myself pushing other people’s products, using myself just to promote someone else’s position rather than my own. But given the state of the Web and social networking today, that’s what it seems a lot of people have to do. Note: I see I did a take on this question March 24 of this year. But I thought it was worth revisiting, given the rapid growth of "reputation management". As I see, it's no longer possible to have a blank reputation. The recent recession has, of course, raised a good practical question: would I have actually gotten and kept the teaching jobs had I invested my own money in licensure. Despite the demand for teachers, especially in math, there have still occurred some layoffs. My best chance to get back into education would be to help the schools to develop a program to deal not only with basic Internet safety but also with reputational issues too.